Curb Appeal is locally owned and operated - NOT a franchise! We've been installing concrete landscape edging longer than any other company in Appleton, Green Bay, and the Fox Valley area. 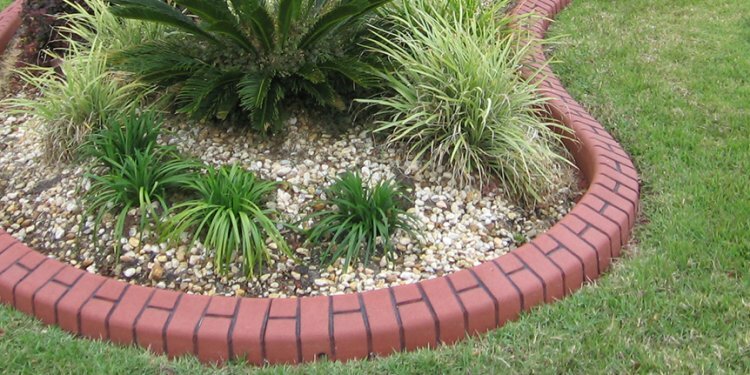 Our quality concrete curbing provides a long-lasting solution to traditional, ineffective and unsightly black plastic landscape edging. Choose from a wide array of colors and stamped curb patterns. We're sure to have the perfect design to accent your landscape and improve the curb appeal of your home. Contact us for product information or to schedule a free design consultation and estimate. Slant Style: The slant style mold is the shape required for most stamped borders. It has a clean and simple design by itself. Stamps for this shape include a variety of brick, stone and other patterns. A texture can be added to enhance the curb further. The slant mold offers the most flexibility when it comes to custom designed borders. We are happy to assist you with any design ideas you might have. Mower Style: Though both the slant and mower styles work well with a mower, the shape of the mower style is easier to mow around with a riding mower. It's shape allows you to place one wheel of your mower on the lower edge of the curb, which will greatly reduce the amount of "weed-eating" or edging required around beds or borders.